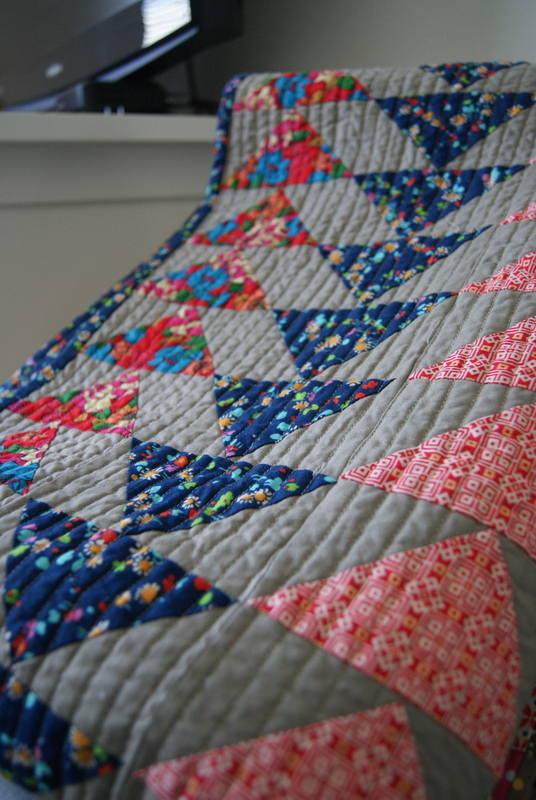 I spent four naptimes densely straight-line quilting my Liberty geese quilt, and the fifth tacking down the binding. Thread tangent: I went to Joann’s three. times. for thread. 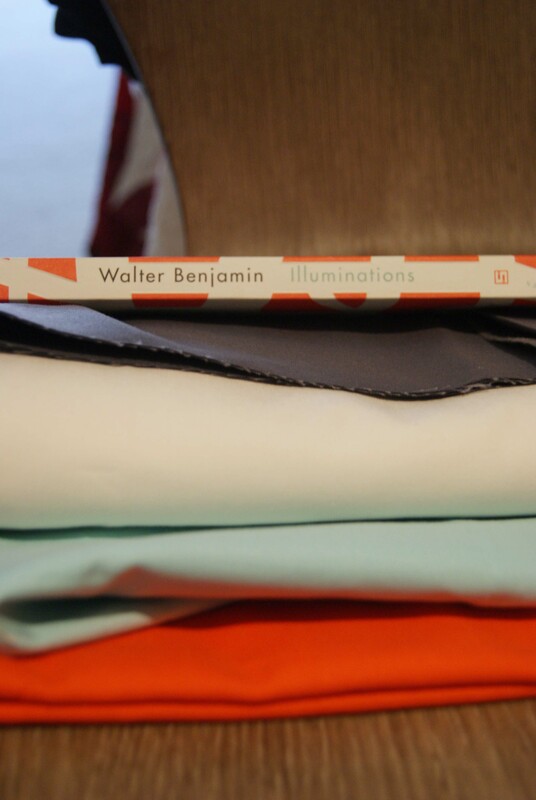 Coats and Clark, I know, I know, but the Old Linen shade perfectly matched the Moda Dove background fabric. I told my husband that while I don’t like to cheap out on fabric-thread-yarn, I really felt like the poly C&C performed much better than any of the other threads I’ve used for machine quilting so far. Next month I may give Aurifil a shot, though it’d have to be pretty awesome to beat the ease of C&C. Bear with me through some awful photos. 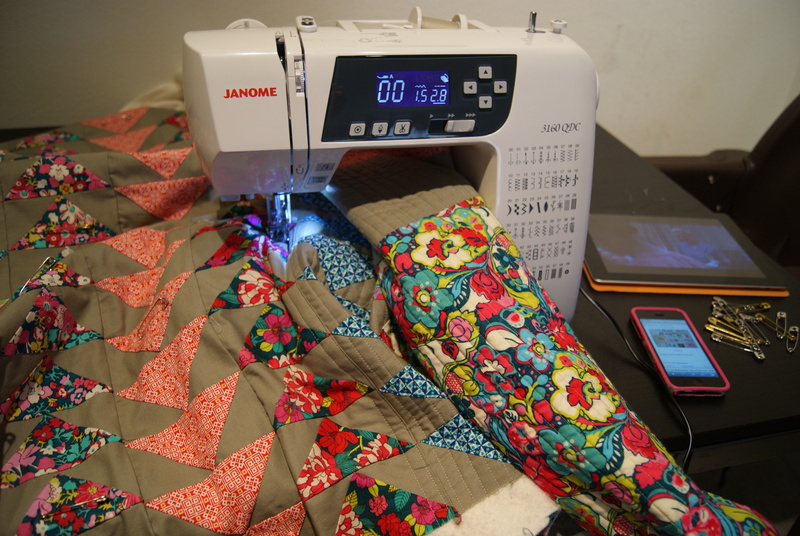 The weather was appalling for the third weekend in a row, and I didn’t want to take my prized Liberty quilt out in winter mix for photographing. You can see a peek of the backing in the very first photo, where it’s crammed in the throat of my machine. I backed it in a piece of the “Catherine” print that I bought to make myself another Tova. (Ha!) 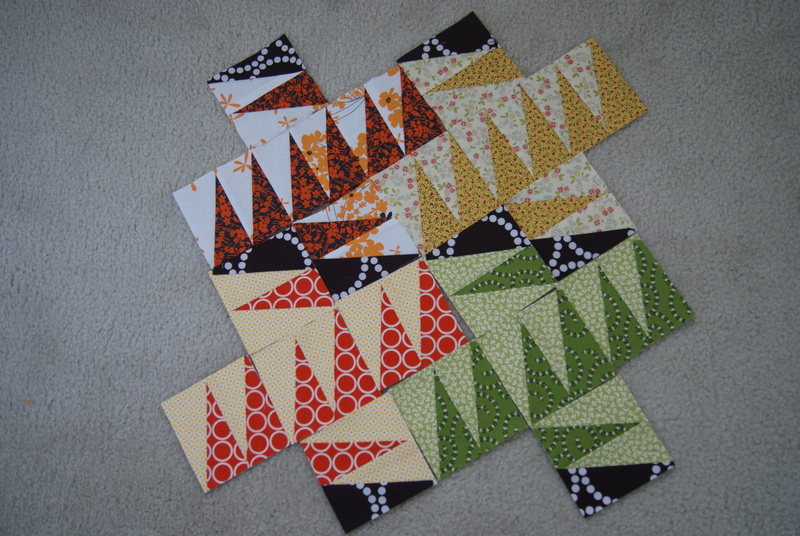 And then I pieced the last scraps of the background, and two colorways of the Charles print, and quilt back. The binding is the “Dorothy” print in navy. Linking up with the Let’s Get Acquainted Blog Hop, this week over at Better Off Thread! 1) I’m tired of February. Aren’t you? Snow (only 2”, but RIGHT AT THE WRONG TIME) canceled another one of my fun mom-day-out weekend plans. 2) So now I’m extra February-crabby. 3) And basting is SUCH a chore. So many wrinkles to smooth out! 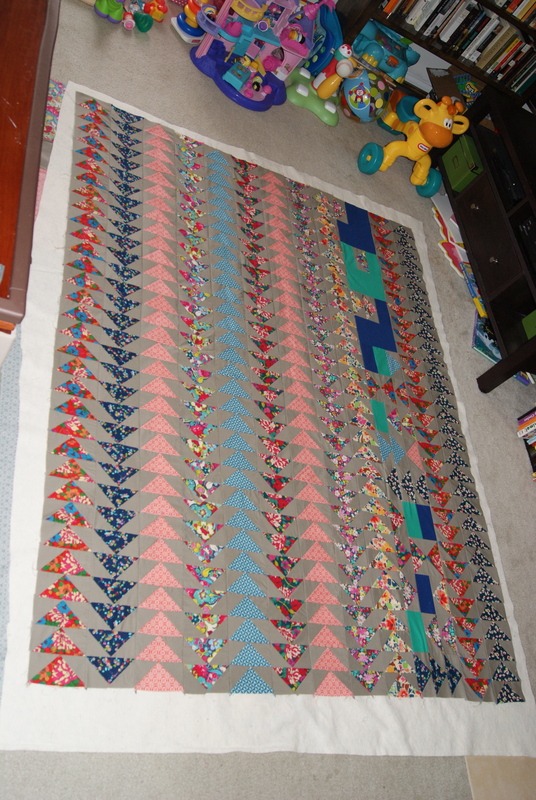 4) And I’m not sure that having added the two blue solids to this quilt top is working for me. It’s sure enough different, but do I like it? I keep squinting at the layout like I’m trying to make it work, or figure it out. The top is together now, and I’m not likely to unpick, and I’m really feeling the need to just SEW SOME LONG STRAIGHT SEAMS. So I’ll pin, put the walking foot on my machine (another hate chore!) and sew sew sew. Until I’m not crabby anymore, or until it’s not February anymore, whichever comes first! Christmas is two weeks from tomorrow. We leave for TN in 12 days. So, while I haven’t been here in 10 days, I’m certainly still trucking. I have a lot left to do, but on Saturday, I felt for the first time like I’m actually going to get it all done. Or…enough of it. 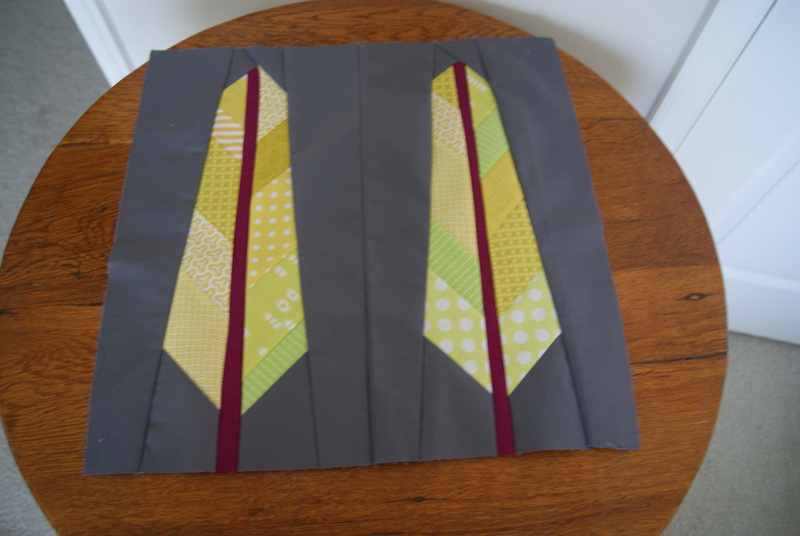 I’ve finished handquilting my MIL’s Fire Drill quilt, and have chosen the binding. 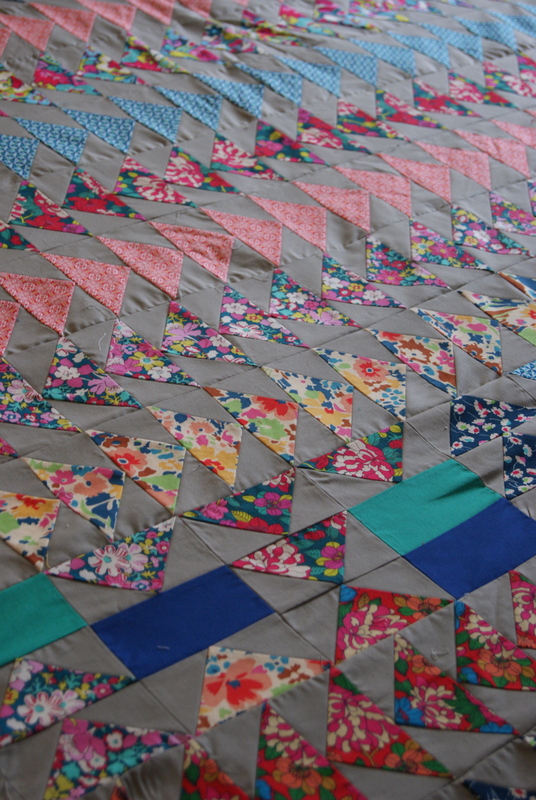 I’m halfway-ish through quilting my mom’s Sparkle Punch quilt–more on that in a moment. I have about eight rounds left to knit on MY honey cowl, and then two small half-versions of the honey cowl to knit for my sisters (in the awesome highlighter-yellow and shocking pink MadTosh yarns above). 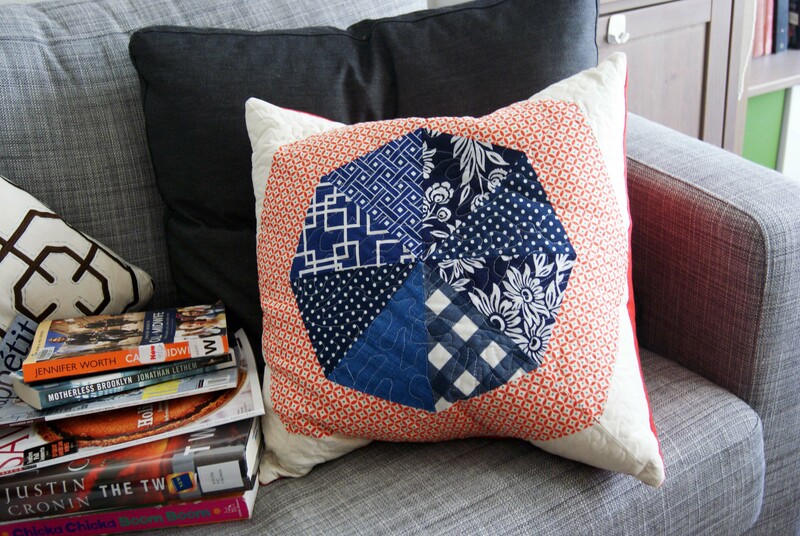 And I have two quilted tote bags to piece, quilt, and finish, using this tutorial. And one or two more aprons. And one makeup roll. I hope to write a more detailed review of my thoughts on the Janome after I’ve used it for awhile. And I’ll definitely post as I finish this pile of projects! Good luck with all of your crunch times. Will you make it?! Yesterday I struggled mightily to sew this. 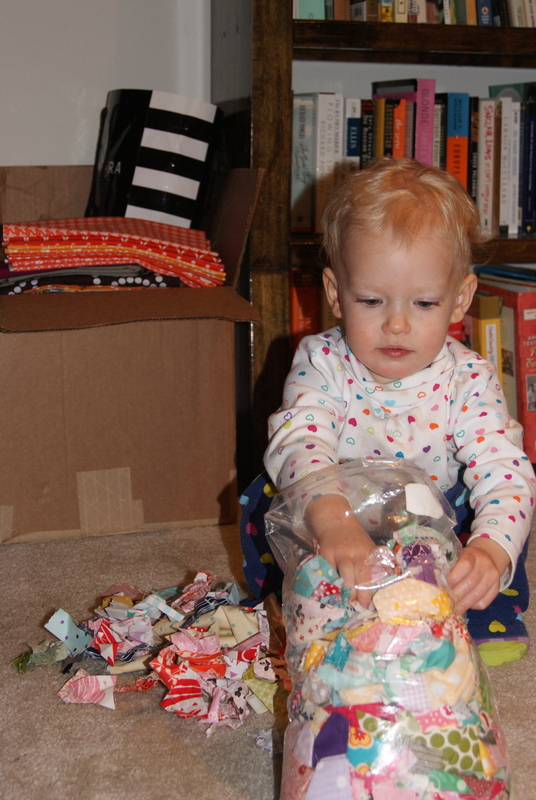 Three piddly Sparkle Punch blocks from Elizabeth Hartman’s early 2012 (it’s still that year! I’m not SO behind!) Sparkle Punch QAL. This one’s for my momma. And do you see the FMF on the top of that right hand stack? And the Pearl Bracelets? That’s because my momma is awesome. She taught me to love fabric, so only fabrics I love get to be here. 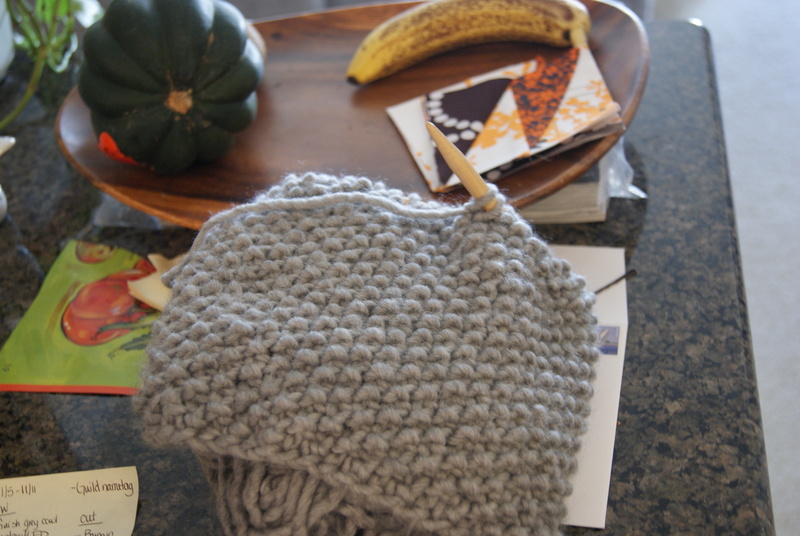 My Honey Cowl, which is really a quick, easy knit, but. But. 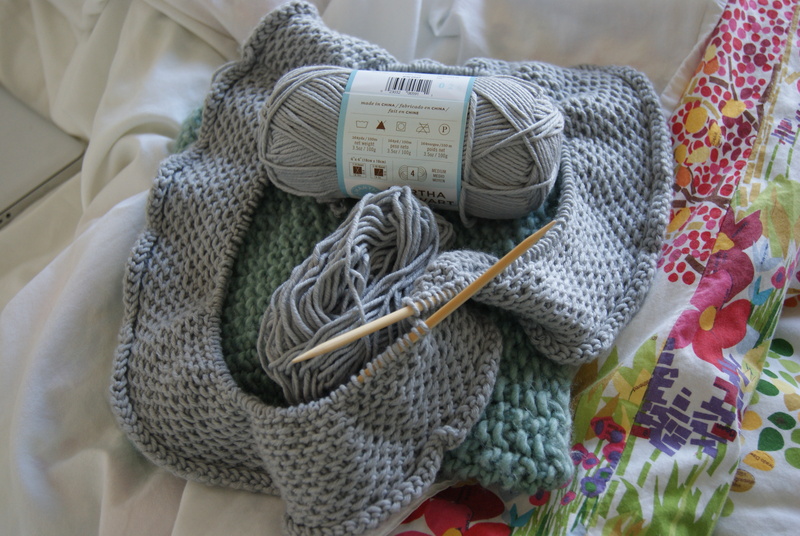 has been sloggy and desperate and with weird stitch-count problems. Did I drop a stitch? Did I make another one, or just find it later? Beginner knitting. So, I’m not making any progress on Project Handmade Christmas. And, get this 19th-century problem: the baby was up with the croup last night! I think she’s fine (she’s still sleeping it off, though I have a mother’s fear that SHE’S NOT SLEEPING SHE’S COMATOSE–no, really, it’s hard-won sleep and we’re all okay). But today is probably shot. And I need to make rolls and piecrust for Thursday, which I am desultorily hosting. Citron-berry-and-coal AMH Feather Bed block. Meant to be a quilted pillow for SIL. I love this block so much it and some of its friends are going to be our queen-sized bedspread, replacing our pitiful much-washed-and-be-holed PB duvet cover. A crappy, doesn’t-do-it-justice picture of my fall-colors Bargain Basement blocks. I love them, love them (may also do a queen-sized of this, as it seems to grow fast) but, as they’re for me, have got to shelve it. So today! Before Thanksgiving! While we are sick and overwhelmed by Christmas already! I will make something, or sew a stitch, or knit a round, and I will not lie down on the ground, having given up! 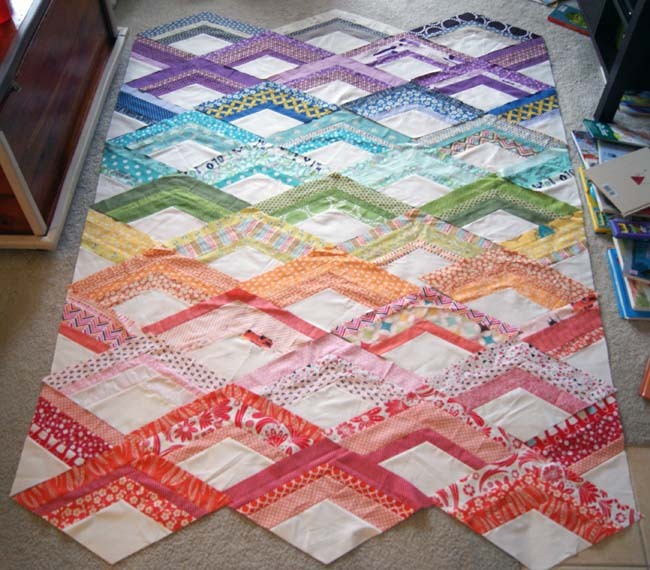 I’m working hard to get this top totally pieced by the next meeting of quilt guild, so I can have a new quilt project for show and tell. Piecing this has been not a picnic, but it hasn’t been too awful difficult either. I look at this picture and think, man, it looks like I worked hard. Sure I did work hard, but…this wasn’t any kind of tricky, either. The result is so classic and lovely but also just a touch different. 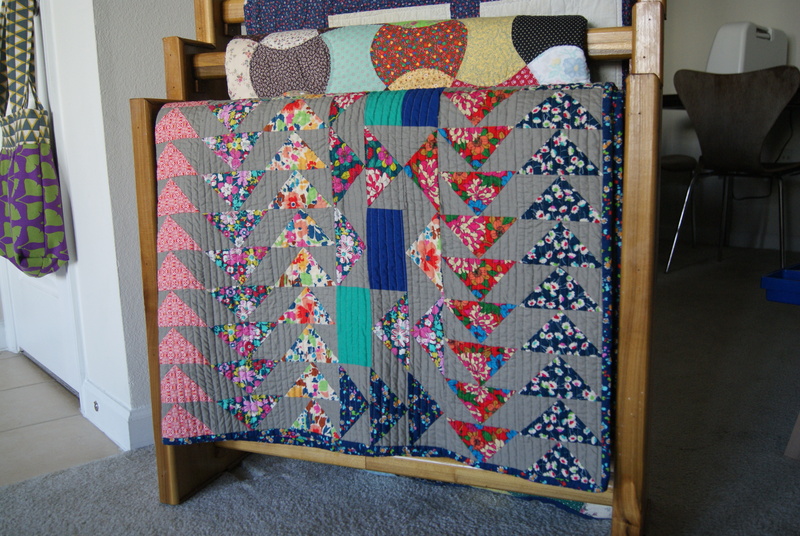 Prediction: more people will make this in 2013, and it’ll become a modern quilting classic a la wonky crosses or similar. Truth. I also finished my “one-night, easy, seed-stitch cowl,” aka My First Knit. It’s LOVELY. Pics this week? 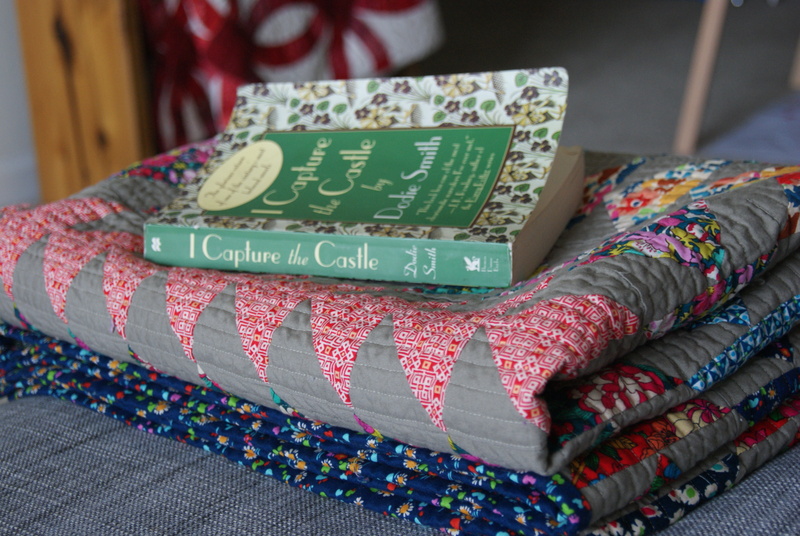 This afternoon while watching Call the Midwife I finished tacking down the binding on my Spinning Stars quilt, so I also need to post a wrapup of that one. Preview: I don’t hate it anymore. I wrote myself a little to-do list for this week, and it’s hysterical. In all senses. 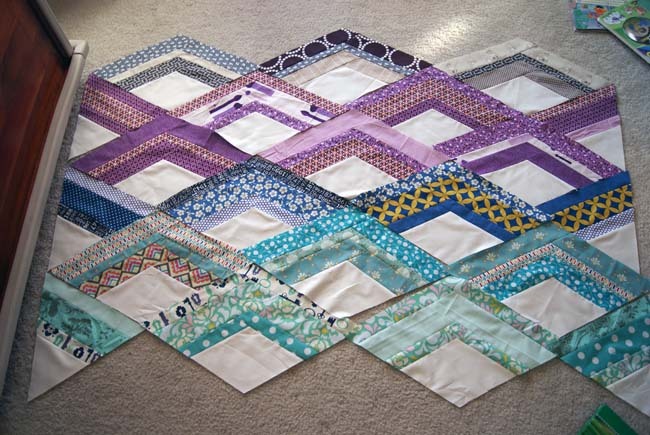 I just counted the weeks until the mail-for-Christmas deadline and I’ve got to make about 1.5 gifts (aprons/pillow covers) per week to make my deadlines! 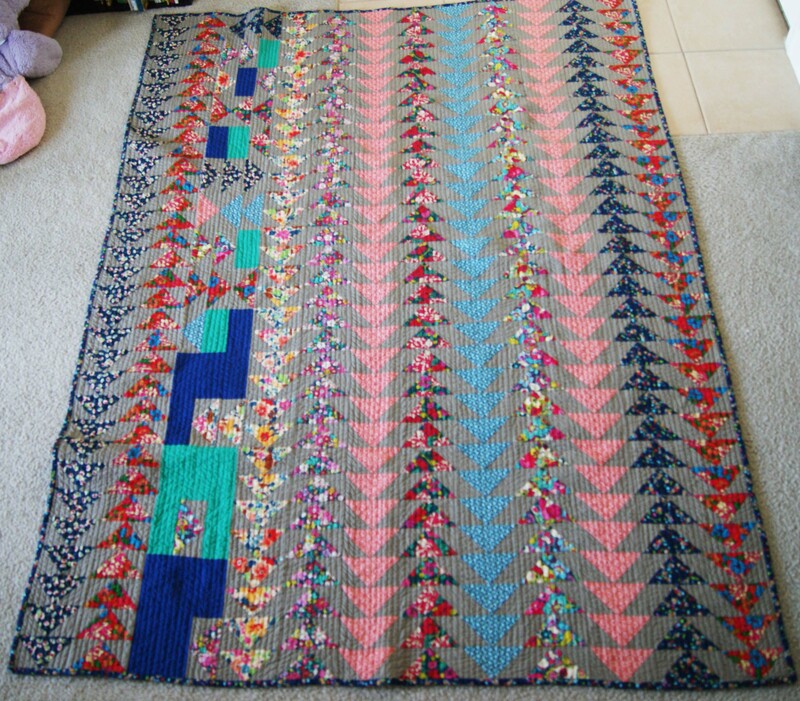 Plus, seeing as how the Fire Drill is for my MIL and I’ve never made ANYTHING for my own momma, I’d like to get her a quilt in the works for Christmas (I’m thinking the Grass quilt from Sunday Morning Quilts, only in teal/turquoise; I’ll call it “Sky”?). 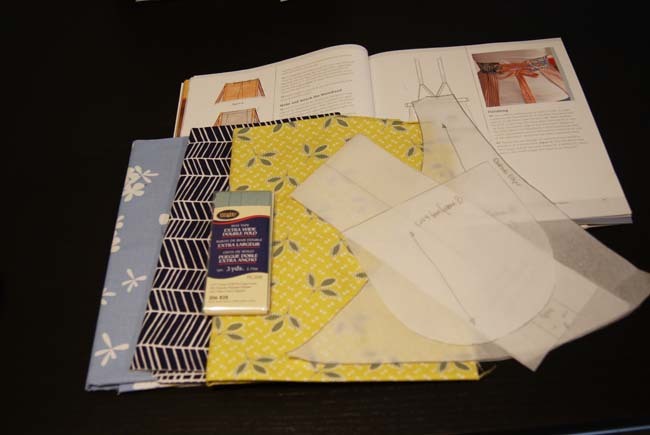 I’d also like to join in on the Value Added QAL by doing a version of Badskirt’s Bargain Basement. And there’s the issue of my quilt guild nametag. And my Tova. And the knitting, which is becoming a new, insane problem. It’s not a sit-and-sew quilt, though. I joked to my husband that it was called Fire Drill because I’m up and down to the iron so often that it’s like doing a Fire Drill, over and over again. My ironing board is in the opposite end of my apartment from the sewing machine, though, so if you’re blessed with a better setup, you won’t feel like you’re all over the place. Probably the up-and-down isn’t so bad. I’ll be glad to burn off some of these Honey Boo Boo calories. 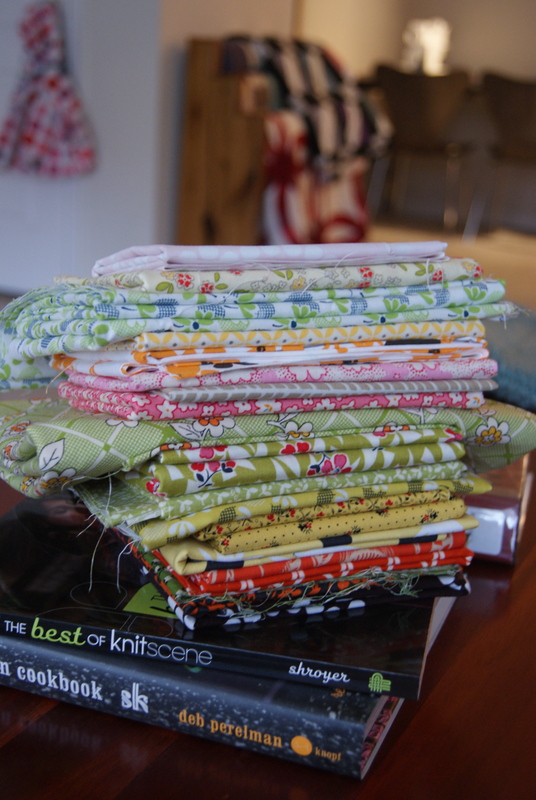 Hoping to spend this Friday and some of this weekend making more blocks, and maybe I’ll start an apron or two. 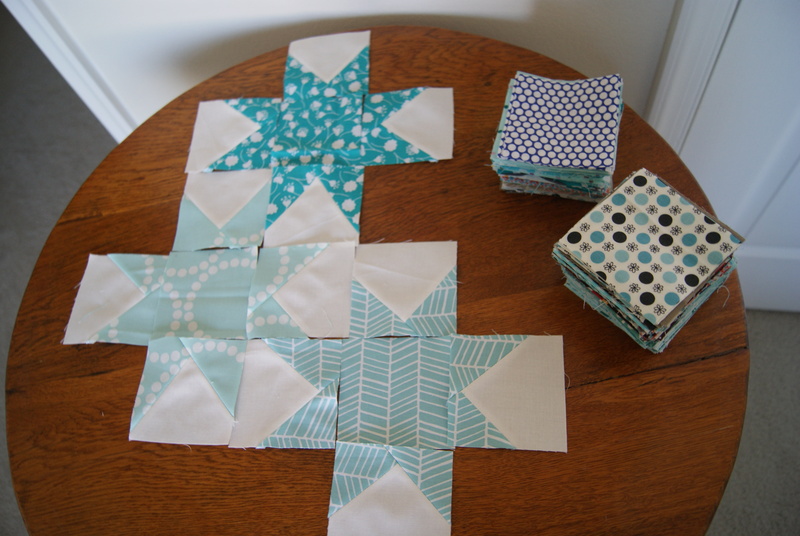 I’m setting a tentative end date for my Spinning Stars hand-quilting at…next Friday. I’d really like to have that one done so I can start using it! Hoping the fall weather brings you all lots of sewing time, and some lovely baked goods. Wow, when you stack it all up like this, it looks like I might sort of have a problem. 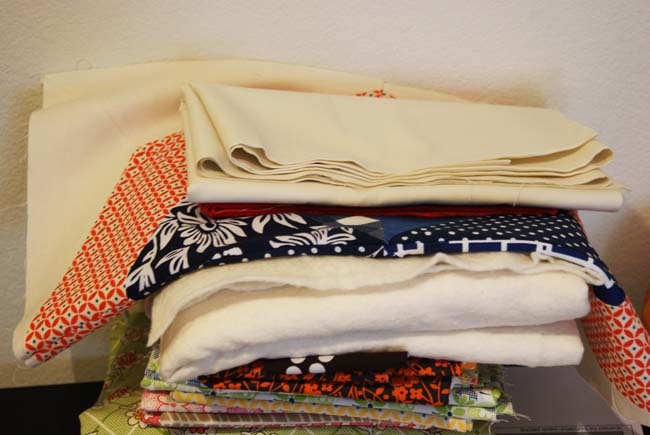 Yes, I feel totally stashed up, prepared for Christmas crafting and the year of sewing ahead of me! 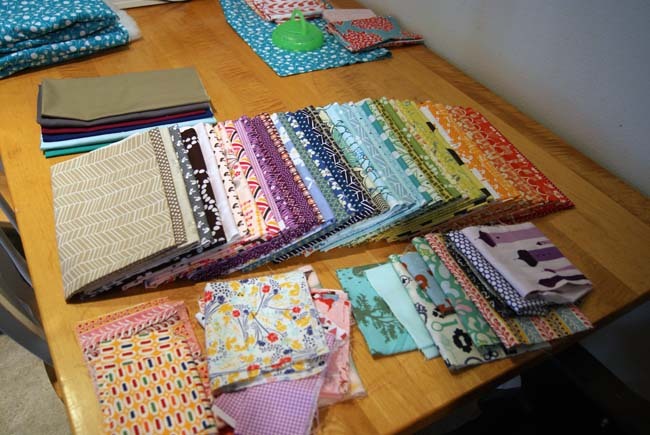 This little pile to the right of the main “stash rainbow” is a couple of little scrap bags I picked up from Pink Castle Fabrics when they ran their 20% off bundles sale a couple of weeks ago. Best. Fabric. Purchase. Ever. 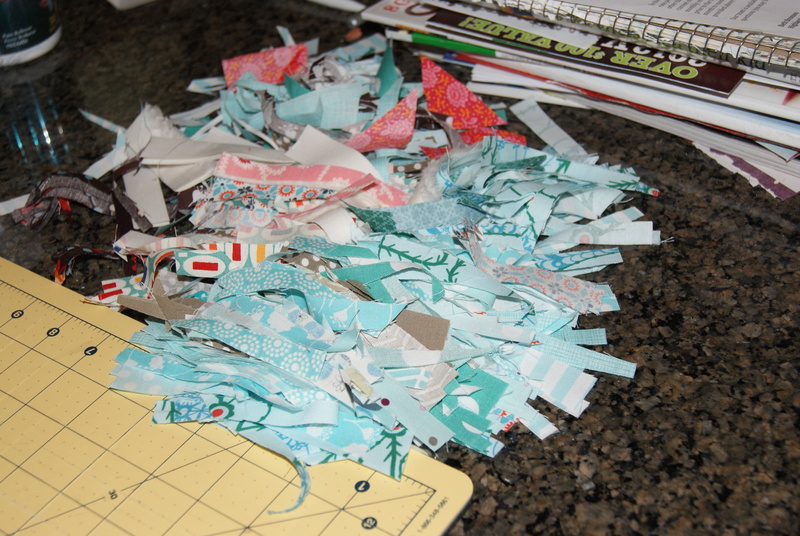 These are WOF scraps ranging from about 3” to 8 or 9”, and every last piece is good stuff. No uglies. 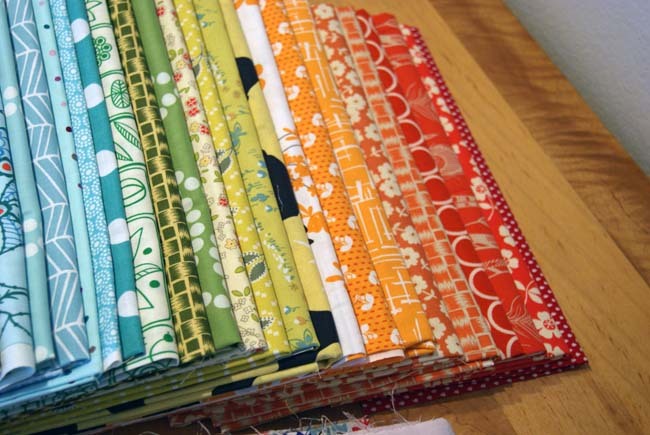 I’m planning a scrap vomit quilt for early 2013, so even uglies would have been fine by me. But no, I got some FMF 2012, a piece of 1001 Peeps, some Aneela Hoey, some Lori Holt, Pezzy Dots, and that GORGEOUS piece of Anthology Maya right in the middle. (Have I mentioned that I immediately hit Etsy and found more yardage of several prints from this line and I have 4.25 yards of that still coming?) Scrap bags. Do it NOW. And now I feel like I have my favorites from every line of fabric that came out this year. 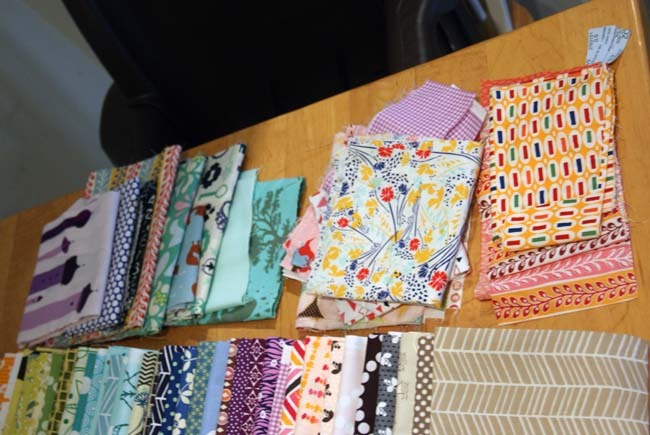 Seems it was an extraordinarily good year for fabric, and there has been so much to pick from that I haven’t been able to catch everything that I wanted. I got some Madrona Road (though not that Memoir print CURSES), Field Study, (more) Seaside, Hope Valley, and was lucky to find a few Pearl Bracelet prints on Etsy. Whew. Forget ‘splaining. 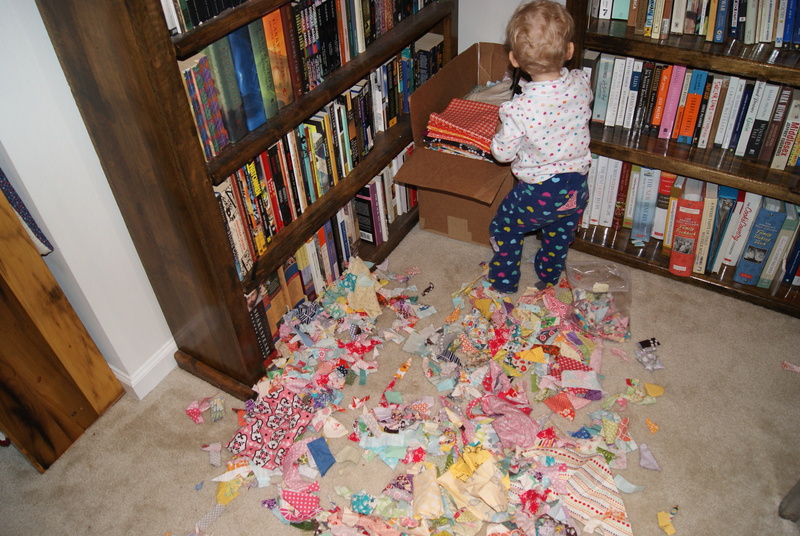 Somebody has some sewing to do.